Last week, Leap Motion held their first developer meetup at the popular 111 Minna Gallery in San Francisco. The event marked the beginning of an ongoing monthly series that gives our team a chance to have face-to-face time with developers in the local community. We recently released v1.0 of our developer SDK, so we thought it would be a great opportunity for our colleagues in the engineering and product teams to provide some insights about the post-launch landscape and the road ahead. The evening kicked off a little after 6:30pm, with a long line outside the doors and developers waiting to get in. With over 100 people attending, the energy in the room was high. We started the meetup with an open bar, Patxi’s pizzas, and a chance for developers and the Leap Motion team to connect and chat. As the pizza boxes emptied, we ushered everyone in to hear from our engineering team. The panel consisted of David Holz, CTO and co-founder; Raffi Bedikian and Kevin Horowitz, both members of our Software Team; Isaac Cohen, creative research; and Dan Peterson, Director of Product. A quick show of hands revealed a fairly even mix of developers, with roughly half already familiar with the SDK and a fairly even split between web developers and native app developers. 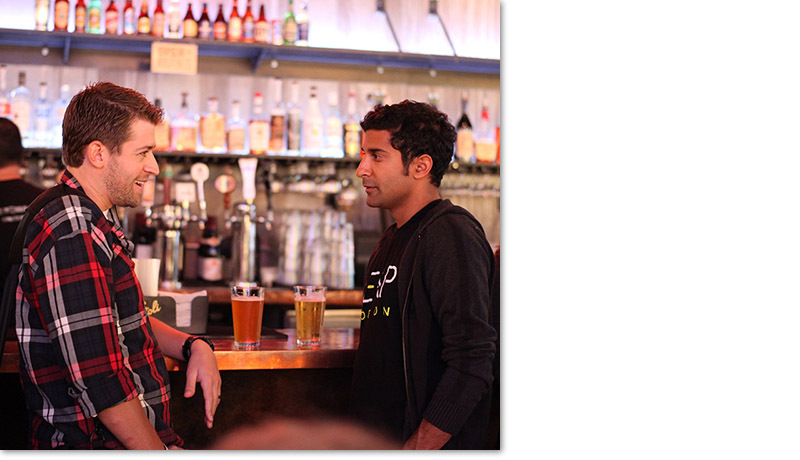 AirHarp and AirBeats developer Adam Somers has a beer with Avi Dabir, Director of Developer Relations. David Holz introduced the session, diving deep into the fundamental vision behind a technology that has the potential to bring humans and technology closer – bridging many of the familiar intuitive physical world interactions with the digital space. As technology has evolved, the interface has been abstracted away to the point where interaction is completely detached from the action we’re trying to achieve. David envisions a future where everyone – young and old, tech nerds and noobs alike – will be able to intuitively understand the technology they’re interacting with, just as easily and instinctively as picking up a coffee mug. The experience of manipulating 3D objects with your hands goes to a whole new level when coupled with the Oculus Rift VR headset. David’s talk segued into a sneak preview of some of our team’s ongoing projects. Isaac presented his demo showing how a scrolling interface might look for a Leap Motion app. He explained some of the intricacies behind several of his experimental approaches. Because this is a completely new way of interacting with technology, he argued, there are no rules. This presents both a challenge and great opportunity for ambitious developers who want to help pioneer these new design patterns for future developers. Dan followed up to explain a little bit about Airspace, including what Leap Motion is doing to improve the platform from its initial version. In the future, Dan said, the plan is to bring web apps into the Airspace Store, adding more currencies and localizations for the roughly 113 countries that received Leap Motion Controllers, and lowering the friction for getting involved with a paid app – possibly by allowing brief trial periods before download and purchase. Yu-Jang demonstrated his robotic arm with multiple degrees of freedom. The arm runs using servos driven by Arduino boards. The arm uses a custom-built inverse kinematics engine to mimic the movement of the user’s hand, and the claw opens and closes as the user pinches their fingers together. Yu-Jang watches as his robotic arm is taken for a test drive. Gerald Terveen has been developing software for both the Leap Motion Controller and the Oculus Rift since very early days. His game Licht also provides full 3D Oculus VR support, and is available in Airspace. Gerald showed off some simple Oculus + Leap Motion demos that allowed the user to manipulate the virtual environment around them by manipulating 3D objects in the virtual world. Licht developer Gerald Terveen (right) demonstrates a few of his experiments combining the Leap Motion with the Oculus Rift VR headset. Adam Skubel demonstrated his Facebook photo viewer which provided a chance for attendees to see how we may be viewing rich content in the near future. Adam’s app uses an adapted tap technique that he explains in his post on Developer Labs. Pohung Chen has been creating a selection of Unity3D examples for our community that highlight some of the new and innovative interaction methods made possible with the Leap Motion Controller. The examples included grabbing and throwing objects, two-handed flying techniques, and Jedi-style Force control. Pohung is a regular contributor to Developer Labs. See more of his work here. Our meetup on Sept. 3 in San Francisco was the first in what will be an ongoing series of monthly meetups for our developer community. To register for next month’s event on October 23, check out our Meetup page.